Thanks for the web site. I've found it useful and therapeutic. I'm a 34 yr old female and just had my Left Hip replaced. I had a SROM uncemented titanium metal on metal prosthesis installed on Nov. 5, 2002. My condition is due to congenital hip dysphasia, the hip socket was never completely formed. So, in addition to the hip replacement, the surgeon also grafted part of my femur up into the socket. (That is what the two screws are holding together). 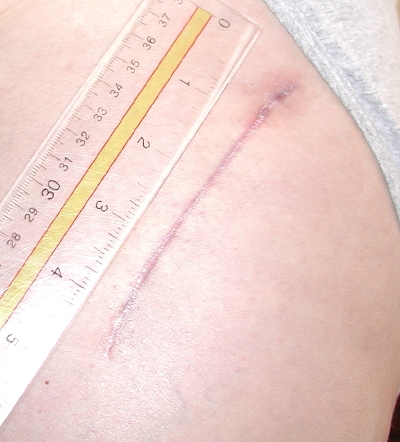 Initially, I had to go 6 weeks without putting any weight on my leg (due to the location of the bone graft). Now, I'm 6 weeks post-op and ready to get rid of my walker. Here is a picture of my post-op x-ray and 4 1/2" scar. The surgeon is located in the Dallas, TX area and I would highly recommend him for any joint reconstructive surgery. Although the recovery has been longer than normal, I'm still very, very happy with the surgery and the results. click on images to see a larger views.